You have to look a long way back to find the New York Times making use in a non-literary or colloquial context of that word. [Nor does that headline appear in the print edition]. COSGRAVE EXTOLS THRIFT OF IRELAND; Glowing Financial Picture Painted by Free State Head in Address to Bond Club. GUEST AT THE LOTOS CLUB Dr. Butler Hails Him at Dinner for Brave Struggle--He Reviews "Fighting 69th" at Armory. A glowing picture of the financial present and future of the Irish Free State was presented by William T. Cosgrave, President of the Executive Council of the Irish Free State, in an address to the Bond Club at a luncheon yesterday at the Bankers Club. Brian Cowen will be over in 2 weeks to give the same speech. Jonah Goldberg hates paying taxes. Adolf Hitler hated paying taxes. Here's an issue that comes up occasionally in the world of political consulting. If you've allied yourself with "liberal" political causes in the USA, what obligation, if any, is there on you to choose for whom you'll consult in other countries? Leave aside the issue of whether you've got the necessary local political knowledge to be a good consultant outside the home country, an issue that comes up with all those Democratic consultants who head over to the UK to consult for Labour. The issue instead is knowing your client. Which is why the apparently natural gravitation of American consulting firms towards Ireland's semi-permanent ruling party, Fianna Fail, is unfortunate. Bob Shrum was on that trail for a long-time when a rudimentary Internet search would have turned up lots of stuff about corruption and regressive economic policies. But maybe the Celtic Tiger and the apparent endorsement of the likes of Chris Dodd of Ireland's ruling class helped. Now however the Celtic Tiger is with O'Leary in the grave and Fianna Fail's role in putting it there is clear to everyone outside the true believers. So what are Barack Obama's New Media people at Blue State Digital doing working with them on their new website and even participating in what sounds like a farce of an event where the audience thought there were at a new media seminar by Joe Rospars but which was actually a political event to launch the new FF website? Now in the big picture, it's probably all moot. It's too late for a flashy website. But Ireland does have more worthy clients for such an effort. Maybe they can't afford Blue State's price (wonder how FF can?). The other potential clients might want to investigate who did Nicolas Sarkozy's website for his 2007 presidential run -- because in fact Sarko's web efforts were an important influence on other campaigns. Thus every Minister in the 2003 Cabinet could legitimately be held to account for the decision to use armed force in Iraq. He makes it sound like a concession that each and every minister is accountable for that decision. Some day perhaps we'll have a property market truth commission in Ireland. The tribunals certainly haven't served that purpose, at least not on a time scale or cost that people could live with. But how soon we forget there was one man in charge of Ireland for 11 years, 1997-2008, Mr Bertie Ahern, TD, who apparently is still dining out on the Celtic Tiger, at least in countries where news of its demise must be arriving by pigeon post. There were many angles to Bertie's "whatever you're having yourself lads" approach to governing. But one was the love-in with Irish-American politicians. Things are different under Barack Obama (note that the St Patrick's Day shamrock ceremony has still not been confirmed for this year). Interesting question: what role did the property market play in the ties to Irish American politicians? Consider Senator Chris Dodd (Democrat of Connecticut) whose name comes up every so often in the US mortgage disaster. Here's former Connecticut State legislator Kevin Rennie (with a disclosed party affiliation) putting together a dossier which suggests that Dodd's Connemera cottage has been subject to some strange dealings (found via Glenn Reynolds). Rennie doesn't go into the fact that there is an AIB mortgage on the cottage as he focuses more on the transactions with the original co-purchasers. But one comes away with the sense that even if it's all legit, there was an overly cosy connection between Dodd's property dealing, horse racing, and political backscratching -- which is pretty much the essence of Ireland's cute-hoor collapse (lingo explained). If we can't get any real investigations in Ireland, maybe the US Senate could consider an Irish dimension to whatever they investigate? Governor Sanford, South Carolina has the third highest unemployment rate in the country. Under the package, you would get $8 billion that the White House says would create 50,000 jobs in your state, and yet you say you may not accept all of the money, including some of the money for unemployment benefits. Why not? SANFORD: Two reasons. One, at times it sounds like the Soviet grain quotas of Stalin’s time -- X number of jobs will be created because Washington says so. And that’s not the way that jobs get created. UPDATE: And here's a reminder from Russia (in the course of a historical dispute with Ukraine) about the impact of Stalin's grain quotas. FINAL UPDATE 12 MARCH: Sanford moves from grain quota comparisons to Mugabe hyperinflation comparisons. Gordon Brown -- We want to ensure that the new banking system that emerges over the coming years meets all these requirements - and becomes the servant of our economy and society, never its master. The master/servant usage has a long lineage but the quote seems to owe equal parts to Francis Bacon and Winston Churchill. Maybe that's why they want the bust back. Megabands like Coldplay don't need links from bloggers but their new video is extremely funny. They should make the Youtube embed code a little easier to find. Times have changed in Ireland. The British-Irish Council met yesterday in Cardiff. Taoiseach Brian Cowen attended. His predecessor Bertie Ahern would never have let this happen. Because he would have arranged for the Council to meet one month from now, Friday 20 March, no doubt going there direct from Washington after St Patrick's Day, and then would have stayed for the Wales v Ireland rugby the next day (good corporate hospitality packages still available). Maybe there really is some understanding that the rules have changed. 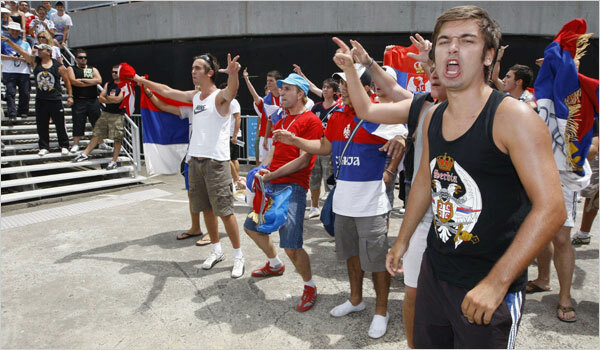 Here we see a protest which pitted Serbs against Bosnians at the Australian Open tennis in Melbourne in January. The protests culminated in chair-throwing and scuffles. Unlike with the Israeli Shahar Peer, there has been no case of players of former Yugoslav ethnicity being denied visas due to "security fears" to play in tennis tournaments since the Melbourne violence. Nor have there been any arrangements, as in Sweden, to play tennis matches involving former Yugoslavs in empty arenas. Very odd. Conservative economics punditry is in a very strange place these days. Paul Krugman notes the apparent reverence for the 19th century. Consider also the chorus of Right On Dude that greeted CNBC correspondent Rick Santelli's rant on the Chicago Mercantile Exchange trading floor yesterday. National Review's K-Lo called for a Palin-Santelli ticket in 2012 (she really doesn't think much of Congressional Republicans, does she?). Got that America? You're just like those traders on the CME floor. Now that those of us who have been making steady, on-time payments on our mortgages for years will be paying off others’ mortgages through our taxes, can we claim a tax-deduction for our neighbors’ mortgage interest too? As this apercu seems to understand, Glenn and Edward already get their deduct their own mortgage interest, meaning that for years, their homeownership has been subsidized by the general taxpayer -- including renters. Given the role that homeownership boosterism has played in the crisis, shouldn't it be renters who get to be superior over everyone else? Isn't Sir Allen Stanford essentially the same person as Sir Stuart Wallace from the Beastie Boys' Sabotage video? The Vatican expert George Weigel, in a recent essay in First Things, an American religion journal, criticized the Vatican for its "chaos, confusion and incompetence." Charity requires that one concede the possibility that genuine piety was a part of Pelosi’s (rather boorish, and certainly irregular) insistence on being given a private moment with the pope during her current taxpayer-funded junket to Rome. Nancy Pelosi is Speaker of the US House of Representatives and therefore a top elected official of one of the co-equal branches of the US government. So what is the relevance of her trip to Rome being taxpayer funded? Weigel never complained about George Bush being on any junkets in Rome, and certainly didn't complain about the non-Catholic Bush getting his own private Benedict when he was in the Vatican. But her office’s statement on today’s meeting makes it clear something else was afoot: that Pelosi, who shamelessly trumpets her “ardent” Catholicism while leading congressional Democrats in a continuing assault on what the Catholic Church regards as the inalienable human rights of the unborn, was trying to recruit Benedict XVI (“Joseph Ratzinger, D., Bavaria”?) to Team Nancy. This from the person whose contribution to the Iraq war was to try and recruit John Paul and Benedict to Team Bush by arguing that the just war doctrine needed to be revised to fit it (more on Weigel and Iraq here). The strange thing is that the source for his New York Times quote is actually a good description of how shambolic the Vatican was on one particular issue, that of the notorious Fr. Maciel. Did it ever occur to him that some of us have doubts about whether they can screw up other things upon which they sound can so dogmatic as well? Especially in the period after Benedict's apparent blindness to the moral stain of the Holocaust? UPDATE: Welcome Daily Dish readers. And one thing to consider: Is Weigel's outrage about the way the Vatican handled Fr Maciel due to the intrinsic moral wrong, or the fact that it made the First Things crowd look deluded? Hence his botched pronunciation of Namaste at the stimulus bill signing; see about 12 minutes 30 seconds into the video. There must be a David Brooks column to be found in the yoga/solar energy naming synergy. State-rescued Anglo-Irish Bank served champagne at the stated-rescued RBS sponsored Six Nations Championship match between Ireland and France. Bottoms up, British and Irish taxpayers! UPDATE: Things could be worse for the IRFU and Croke Park. They could be the English and International Cricket Boards, which under the theory of fraudulent conveyance, might be obliged by US authorities to return sponsorship receipts from Allen Stanford given that the US government has now claimed that he was running a criminal enterprise. The UK government won't be in much of a position to complain on their behalf, since in the past they have approved aggressive US prosecutorial tactics in financial fraud cases. Ask the NatWest 3. AP report -- DUBAI, United Arab Emirates – Organizers of a major Dubai women's tennis tournament say fears of protests and security threats were behind the decision to bar the entry of an Israeli player. The statement Tuesday was the first from the Dubai Tennis Championships. It came three days after the Emirates denied a visa for Shahar Peer ... The statement said the recent Israeli incursion into Gaza "antagonized" local fans and Peer's presence could have sparked protests, boycotts and threats. Since Geert Wilders was denied entry at Heathrow on a similar basis, does this mean that the UK government would have no particular objection to the UAE denying entry to Israeli athletes, once it gets couched as a security concern? UPDATE: The logic of the Wilders ban would also seem to require a ban on Republic of Ireland Glasgow Celtic supporters travelling to Scotland, since their presence apparently incites protests from Glasgow Rangers fans. The reliability with which US conservative blogs feature "outrageous" items sourced to UK newspapers such as the Telegraph and Mail suggests that there is a service which e-mails the links to likely users. The blogs get a faux-authoritative rhetorical casus belli and the UK papers get links and hits. The above is a picture of George Bush accepting the bust -- on 16 July 2001, nearly 2 months before 9/11. So the part about the bust going back as the end of a loan is probably true. The part about how the loan started is false. And the truth is that the loan was a personal choice of George Bush, before 9/11, and one which suggested that he had in mind being a wartime president well before 9/11 became the excuse for it. Obama Throws Churchill Out of Oval Office [Nile Gardiner] ... 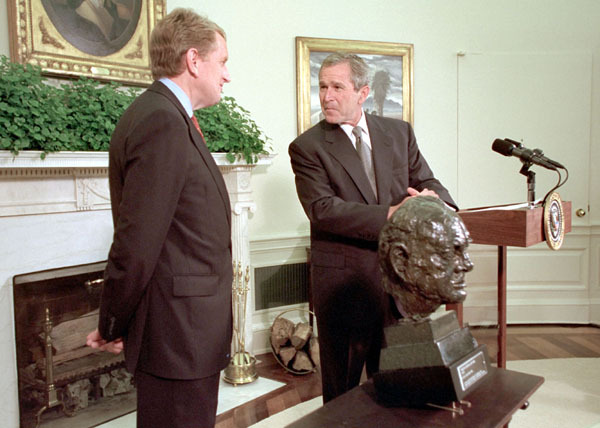 The bust was loaned to the White House in the immediate aftermath of the 9/11 attacks as a demonstration of solidarity with the United States. Obama’s surprise decision to send Churchill home is both wrong-headed and crassly insensitive towards America’s closest ally, coming at a time when nearly 9,000 British troops are fighting alongside their American counterparts in Afghanistan ... Nile Gardiner is the director of the Margaret Thatcher Center for Freedom at the Heritage Foundation. Who knew that the Special Relationship could be derailed by a bust? FINAL UPDATE: 10 months after the original story, Nile Gardiner is still shopping it to a receptive John Steele Gordon, including the factually incorrect claim that the bust was given to the White House after 9/11. Sensing the thickening gloom, Mr. Griffeth pivoted away to Mr. [Nassim] Taleb and said, “You’re not as bearish as Nouriel, are you?” Well yes, as a matter of fact he was. “We have the same people in charge, those who did not see the crisis coming,” he said. This is one of outstanding facts of the current economic crisis: the complete lack of political accountability for it. We'll probably never know the relative weights of wine and cold medicine in the problems of Japanese Finance Minister Shoichi Nakagawa at the G7 news conference in Rome on Saturday. But is he any more out of it than his fellow ministers and central bankers? UPDATE: The finance minister has resigned. And we've replaced the footage with an uncopyrighted version. More here. The emerging addition to the global financial crisis this weekend is the apparent implosion of Allen Stanford's financial empire. Missing in the US coverage of him is any reference to to how many cricket fans will always remember him, as explained in this Sky News clip above. UPDATE: The Securities and Exchange Commission shuts down Stanford, alleging an $8 billion fraud. Is sports sponsorshop the leading indicator of financial doom (even in Ireland)? Incidentally, it appears that Stanford had investments with Madoff! After bellyaching about bonuses, perks, and junkets for the private sector in their respective countries, the top finance officials in the leading industrialised countries (g7/g8) awarded themselves a weekend in Rome to discuss the financial crisis. You might think that a crisis would call for a revisiting of unquestioned assumptions about the structure of these events. It's unlikely that the feature of one woman, French finance minister Christine Lagarde, among the 24 officials, received such questioning. UPDATE: Note the absent slot where the Japanese finance minister should have been. More here. According to U.S. Army Lt. Col. Kimberly Enderle, SAO chief of transportation logistics and accountability, the Iraqi Security Forces have already received approximately $1.5 billion in services, vehicles, aircraft parts, small arms, uniforms, and training through the FMS program and have made commitments for an additional $3.5 billion in FMS purchases. “The strategic partnership between the U.S. and Iraq is growing,” said Enderle. So the new Landsdowne Road stadium will be Aviva Stadium. Aviva is one of those names that consultants were presumably paid millions to come up with, but perhaps Norwich Union Stadium (its old name) wouldn't have sounded so good. Nevertheless it's a brave move taking on an insurance sponsor when insurance companies can resemble banks. But given the resonance of the old name, they could have done the trick used by American naming rights deals and made it "Aviva Field at Lansdowne Road". The Prime Minister: I have tried to explain in recent weeks that the problem with bank lending is actually the loss of foreign banking and non-banking capacity in this country. Half the lending in mortgages and half the lending to businesses came from that source. When that source leaves, as the Irish, American and other banks have left the country or have run down their capacity, the existing banks must do more. Thousands took the day off to crowd the Heysel complex in north Brussels built for the 1958 World's Fair. Organizers had expected 3,000 shareholders. Over 7,000 showed up, Fortis said, the biggest assembly ever. They represented 23% of the 2.3 billion shares outstanding, said Fortis officials. There were so many people that organizers set up two overflow viewing halls. At 11 a.m., they began pouring free coffee, juice and wine. Raymond Cappart, 71, chugged down a glass of red. "My wife told me not to drink, but I'm 70, and I'm not American," he says. "I'm mad." Mr Cappart, a retired bank employee, says he has lost most of the 150,000 euros he invested in Fortis in the 1990s, after he retired. "Why in Belgium can't the government be upfront and not dishonest?" he asked. "I'm mad." At noon, organizers rolled out thousands of cheese, tuna and crab sandwiches. "We had couscous at the last general assembly," says Laurent Bosquet. The 28-year-old invested 12,000 euros in Fortis last summer. The Minister for Europe (Mr. Jim Murphy): My right hon. Friend the Foreign Secretary represented the UK at the informal meeting of EU Foreign Ministers (“Gymnich”) in Brdo, Slovenia on 28 and 29 March 2008. Ministers discussed the release of “Fitna”, a controversial short film on Islam, by the Dutch MP Geert Wilders. They reaffirmed that the right of freedom of expression was a basic value of the EU but stressed the importance of respect for others’ religious beliefs. Suggested followup question to Mr Murphy, or indeed Mr Miliband: did Ministers discuss the possibility of restricting Mr Wilders' freedom of movement through the European Union? Or is this one of the privileges of not being a Schengen country? Suggested question to the Home Office: What happens if Mr Wilders enters the Republic of Ireland and then goes to London under the Common Travel Area? Or is Wilders now also banned from the Republic of Ireland? Many of the programs that I have discussed involve very large numbers. One key element the speech: The TALF is getting another trillion dollars. In addition to having left the hacks' heads spinning with long and often complex answers (for which they are out of practice), Barack Obama had an interesting choice of phrase at the start of his first press conference: referring to the current period as "the winter of our hardship". It seems like an obvious attempt to avoid a direct Richard III reference to the "winter of our discontent", which for one thing is already over by the time that it's referred to in the play. Economists who are skeptical about the spending-heavy US fiscal stimulus package are exulting in the reminder from Mario Rizzo on the NYU Think Markets blog that John Maynard Keynes favoured cutting national insurance (social security) tax rates in a recession. Hence, goes the claim from Tyler Cowen, anyone calling themselves Keynesian is intellectually obliged to support social security tax cuts in the stimulus package. He [Keynes] also continued discussion with Meade on the finer points of stabilization policy. He made clear his continuing preference for using changes in investment to stabilize demand with one exception, Meade's proposed countercylclical variation in social insurance contributions. His reasons were various: he still believed that rapid attainment of capital saturation was desirable; he thought it would be easier to encourage investment rather than consumption in a slump; and he believed that countercyclical tax changes would have little effect on consumption in the short-run except for the working classes, who would be more efficiently affected by Meade's scheme. In other words, besides that single cut, Keynes thought that tax cuts were useless in a recession and the government would have to take the lead in ending the slump through direct management of investment. Now that's Keynesianism we can believe in! Does every player on Manchester United football club own a Bentley? Given MU's sponsorship by AIG, does the American taxpayer know that this is what they are paying for? The New York Fed has released further details of one of the many world-saving acronyms: TALF. As we noted before, this program is going to get the US government into the business of lending money to car dealers to finance the cars on the showroom floor. Which doesn't sound like a great business to be in. Not surprisingly, the "collateral haircuts", i.e. the amount that the government will knock off the supposed value of the cars in deciding how much to lend against them, is pretty high. Example: for a subprime retail car loan (i.e. an actual customer with not great credit), the government will impose a haircut of 9% when that loan comes to them for financing (there's a technicality here related to the life of the security which will contain the loan). For a dealer loan, the haircut is 12% -- the highest of any loan type that can come under this program. One way of thinking about this is that things are so bad in the car industry, even the shaky customer has better credit than the dealers. The fact that public support for Obama’s bill is cratering can only serve to encourage Republicans. Aides say privately that Bush long ago made peace with his low approval ratings, which have persisted despite significant improvements in Iraq, the original source of his polling woes. Some current and former aides argue that Bush's unpopularity has made it easier for him to push ahead with difficult decisions, such as a series of dramatic interventions into the financial markets that have angered conservatives over the past two months. "You're more liberated to act when you've internalized those low approval ratings," said Pete Wehner, a former top Bush adviser. "This is a White House and a president that are in some ways galvanized by a crisis." So if Barack Obama, for example, decided to double the stimulus package, will Wehner compliment his defiance of low poll ratings? Indeed, by helping drive them down, isn't Wehner enabling a radical socialist agenda? When I was Prime Minister I had cause often to reflect on leadership. Courage in leadership is not simply about having the nerve to take difficult decisions or even in doing the right thing since oftentimes God alone knows what the right thing is. It is to be in our natural state – which is one of nagging doubt, imperfect knowledge, and uncertain prediction – and to be prepared nonetheless to put on the mantle of responsibility and to stand up in full view of the world, to step out when others step back, to assume the loneliness of the final decision-maker, not sure of success but unsure of it. And it is in that “not knowing” that the courage lies. Which part of that is his view of Bush -- the Bush who gloried in taking the "tough decisions", who never betrayed a hint of doubt, or the one who donned the mantle of The Decider and needed the Bible (he says) to sustain his faith? He later approvingly quoted a sermon he'd heard in the West Bank: "the greatest danger is not impulsiveness, but inaction" which is Scripture-worthy in its ability to be interpreted multiple ways. Maybe it was just an endorsement of his new friend's fiscal stimulus -- or a dig at his brooding successor in Downing Street? Helping Iraqi internal politics develop peacefully and across sectarian lines is a critical part of reintegrating Iraq into the Arab world, making the world's only Shiite-controlled Arab state acceptable to the Sunni regimes that surround it. Any thought as to what happens when the people in the world's other Shiite majority Arab state get inspired by the purple fingers to demand political control of their country? That would be Bahrain, where things are pretty dicey right now, and where chaos would be a gift to Iran. But in Kagan-world, that would all be Barack Obama's fault. Here is the full text of the intervention from maverick Tory MP David Davis in the House of Commons today concerning the statement from High Court judges that the US had threatened to break off counterterrorism cooperation with the UK if documents relating to torture allegations by Binyam Mohamed were released. David Davis: On a point of order [during debate on the Police Grant Report], Madam Deputy Speaker. I apologise for interrupting the debate, but it is on a matter of the utmost national importance. I would like to raise the issue of a judgment made at 1.45 pm today by Lord Justice Thomas in the case of Binyam Mohamed, a British resident currently being held at Guantanamo Bay who has made an accusation of British involvement in torture inflicted on him while being held in Afghanistan, Pakistan and Morocco. The ruling implies that torture has taken place in the Mohamed case and that British agencies may have been complicit—but, most important of all, that the United States Government have threatened our High Court that if it releases this information the US Government will withdraw their intelligence co-operation with the United Kingdom on matters of security. The judge has ruled that there is a strong public interest that this information is put in the public domain even though it is politically embarrassing. Another part of the report goes on to say that the Foreign Secretary has confirmed that this threat will still remain under President Obama’s new Government. Madam Deputy Speaker, can I request that you make representations, preferably to the Foreign Secretary, or to the Home Secretary, to come to this House today to make an urgent statement on the involvement of British agencies in torture overseas, and on the right of the United States Government to block a British court from disclosing information given to it? Patrick Mercer: Further to that point of order, Madam Deputy Speaker. On this alleged piece of bribery, bullying or whatever it is that has just been discussed, at the same time that a statement is made by a Cabinet Minister, may we also have a thorough understanding of what the American regime would like us to do with non-British detainees in the former Guantanamo Bay prison? Madam Deputy Speaker: I have to inform the House that those are not points of order for the Chair. Yes, we've been a bit short of inspiration in the last couple of days. Normal service hopefully resuming soon. In the meantime, go read Andrew Sullivan, who's probably having trouble believing how right he was about Marcial Maciel Degollado. Angela Merkel kicks papal arse. She's good. Despite the fact that much of it is just a clip-show of years of David Brooks pop sociology, David Brooks' New York Times column today is getting at a serious issue (here's a map of Washington DC which shows the oft-referred Ward 3). There is one group of people which has emerged unscathed and possibly even better off from the global economic crisis: the upper tier of the policymaking apparatus, meaning not the politicians themselves (who at least can be dumped in an election and who do face career risk), but the operators below them who do the actual mechanics of debating, setting, and implementing the policy framework. The same policy framework that accommodated the excesses that has led to the mess we're in. And yet these people now get to direct us all out of it. Harold Cole and Lee Ohanian have an op-ed in today's Wall Street Journal which carries forward one of the most stubborn conservative talking points about the current economic crisis: that FDR's New Deal, often cited as an inspiration for radical action now, made the Great Depression worse. The op-ed is a tough read because it's relying on technical research which the professors are trying to communicate in non-technical language. But in doing so, they are sidestepping the controversies that surround the interpretation of this research. One of these controversies is revealed by one economic variable that they don't discuss: inflation. Their story (which has a supply side philosophy) lays the blame for the Depression in excessively high wages and prices, at least in industries which benefitted from New Deal protections. But there's always been a simple alternative explanation for the Depression: that it was due to chronic deflation i.e. falling prices and expectations of falling prices which made people reluctant to spend, a cycle that was only decisively broken by World War II and the subsequent monetary arrangements, which were completely different from those of the early 1930s. The chart above is part of the evidence. 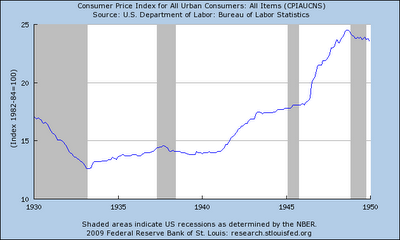 It's the level of consumer prices 1930-1950. Read the 15 line across (which represents an average price 15% of early 1980s prices). Prices plunge below it in the early 1930s, creep upwards, with bumps, for a decade, but only get back above it during the war. After the war, the price level takes off for good -- which happened to kick off the greatest prosperity the world has ever known. But their theory of the Depression is that prices were too high. You'd think that problem would merit some discussion. Bringing it up would be, from their perspective, a can of worms. Sometimes, sometimes, inflation solves a lot of problems. UPDATE 16 FEBRUARY: Paul Krugman spells out the role of inflation very clearly. Richard K. Vedder, an economist at Ohio University... By artificially keeping prices and wages high, he argued, both Hoover and Roosevelt prevented the economy from adjusting, which is why unemployment remained in double digits until the United States entered the war. I'm reminded of the story of Titian, who's the great painter, who reached the age of 90, finished the last of his nearly 100 brilliant paintings, and he said at the end of it, 'I'm finally beginning to learn how to paint', and that is where we are. La Pietà was Titian's last work. In it, seeming to anticipate his death, he depicts himself as Jesus. Has Gordon reached the martyr rationale for his current predicament, an undercurrent that others have seen before?